Welcome to Nipissing Village, Ontario, just west of Highway 11 / Yonge street. Nipissing Village is a hamlet that sits just south of the lake of the same name, approximately fifteen minutes west of Powassan on Highway 534. Nipissing Village is pretty tiny. There’s a museum that’s open during the summers, a display with old logging equipment (reminiscent of the mining equipment out on display in Cobalt), a berry farm, a quail farm, an alpaca breeding farm (that is not open for tours), probably a couple of other farms, a salon and a gas station south of town. Let’s be honest here. Nipissing Village is so small that the post office is someone’s house. Today it seems like a pretty nice place to live – there are beaches, a community centre, a fitness centre and an outdoor ice rink. And there is something of a mini hippie revival going on – there is some sort of whimsy-antiquey-artsy-fleamarkety type shop ont eh main drag, there is an organic seed company (Soggy Creek Seed Company), there’s a cooking studio (though it seemed to be for sale when I was there last), and of course there is Piebird (more on that later). But I suspect those original settlers weren’t so lucky. 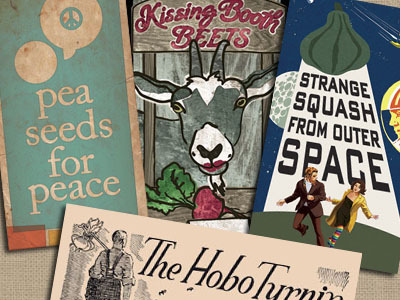 Soggy Creek Seed Company – probably the most innovative seed marketing ever. Named Nipissingan until the 1880s, the village was the terminus for the Rosseau-Nipissing Road – a mucky, dirty, lonely backroads route conceived by the colonial government in the 1850s to encourage colonization between Georgian Bay and the Ottawa River. Originally, supplies were brought into Nipissing from Pembroke by canoe over the Champlain Trail and up the South River until the road was completed up to the Nipissing area in the 1870s. Nipissing Village soon became the main route for shipping supplies into the region and to the fishing outports on Lake Nipissing for about a decade. And boy, was that a decade – three stage coaches arriving per week, a sawmill, a hotel, the usual frontier amenities and all the isolation turned Nipissing Village into something of a party town. That is, until the railway from Gravenhurst to Callander cut Nipissing Village out altogether. It was then that the government’s folly of building a road from nowhere (sorry Rosseau), through nowhere (it’s true Magnetawan) to nowhere (no offense intended Nipissing Village) was revealed. The land was poor, the weather cold, the surroundings isolated, the supplies intermittent. If you’re going to put up with conditions like that, you might as well brave the wilds and farm the claybelt. That makes more sense. Ok this is really cool – a land-locked purpose-built floatplane airport, in Nipissing Village, Ontario – just off Highway 11. We arrived in Nipissing around 11.30 pm at the end of an almost five hour drive that we expected to take maybe a little more than three. Complete darkness, intermittent rain, wet snow, horizontal freezing rain, a few really slow trucks, at least two lane closures, one construction delay, a bunch of those really annoying drivers that speed up and pass you only to slow down in front of you, bad traffic between Bradford and Innisfil, and an extremely leisurely server at the East Side Mario’s in Barrie who assumed that my wife and I were on a date (and not just stuffing our faces so we wouldn’t have to leave Highway 11 for the rest of the trip) all conspired to keep us in the car much longer than possible. When we planned this trip we’d seen stuff online and in “tourist literature” that touted the historic nature of Nipissing Village. The quaint beauty. The idyllic settings. Now – don’t get me wrong, we had a nice time up there. But after all that driving, the anticipation that gets built by unforseen delays, and just a general desire to get my rear out of the Pontiac we increased our expectations maybe a bit too much. So, in some sense, I identified with with the original settlers of the Rosseau-Nipissing Road. OK, maybe that’s a stretch. But who knows what they were told. Who knows what they thought. But too often that government plans are based more in Field of Dreams than reality. If you build it, they don’t always come. You have to feel for the people that took chances back then – we hear about the ones who succeeded, but almost never get to hear about the ones who didn’t work out. That’s history, I guess. DEER! 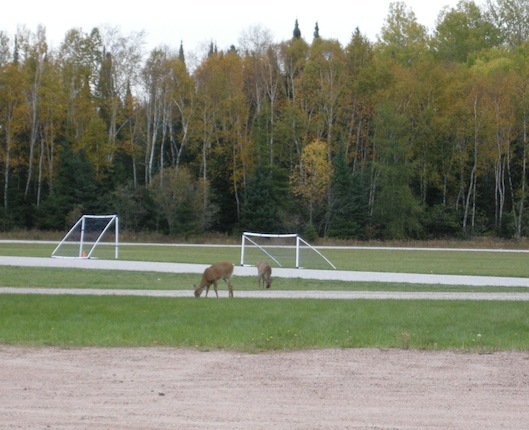 EATING THE NIPISSING VILLAGE SCHOOL SOCCER FIELD! SO COOL! Oh boy, I’m such a southern Ontarian. 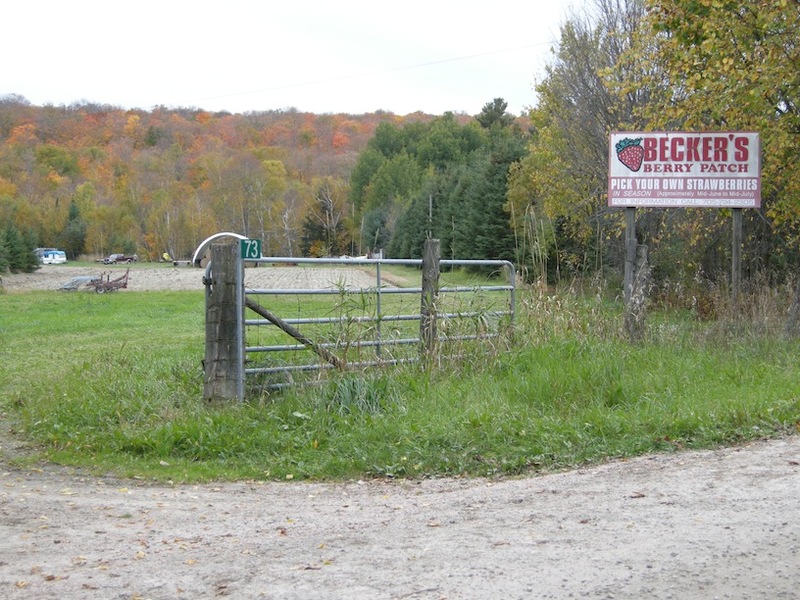 Becker’s Berry Farm in Nipissing Village, Ont. The Nipissing Village Museum with logging equipment on public display. I think it is so neat when little towns find ways, time and money to document and display their history. We were there in October, so we didn’t get to stop in.